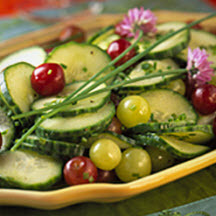 An enlivening accompaniment to any garden party meal, this cool, tangy salad featuring cucumbers, grapes and green onion will put a little kick into those hot summer nights. Combine cucumber, grapes and chives. Mix vinegar, olive oil, honey, salt and pepper. Add to cucumber/grape mixture and mix well. Refrigerate at least 30 minutes.